Hello everyone, Id like to take this time and introduce myself and my business. Name is Rich Sullivan and I run the 30ft ZiggyB (Express Albemarle) out of Shark River Inlet in NJ. As Shark Rivers newest Sport Fishing Charter business, we can offer you the best price on a broad range of fishing (fluke, bluefish, blackfish, tuna, seabass, stripers, shark etc), cruising and relaxation charters. Our enthusiastic and well-trained Captains are available to assist you no matter what type of charter you have in mind. Can’t find what you want, or not sure what you want to fish for? Let Capt Rich set you up a custom charter based on the time of season and/or what is running. We stand behind our service because this is what we love to do. Though we can not guarantee you catch fish, only because of the numerous factors at hand, but we can guarantee you that we will do what it takes to show you the best time on the water possible. Whether it's Fluke, Bluefish, Blackfish, Tuna, or Shark our enthusiastic and well-trained Captains are available to assist you no matter what type of charter you have in mind. Can't find what you want, or not sure what you want to fish for? 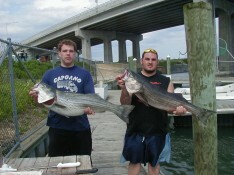 Let Capt Rich set you up a custom charter based on the time of season and/or what is running.